Kate Elliott has created a richly detailed world in Court of Fives , her first YA novel, though not her first excursion into heroic fantasy. Jessamy, or Jess, is a twin, one of four sisters, the daughter of a Patron (or Saroese) army officer, and his Efesa (and hence a Commoner) concubine spouse Kiya. Her father Esladas has done the unthinkable; he has kept his Commoner concubine by him, instead of a Patron wife, and he has kept and acknowledged his four daughters, including a pair of twins and one with a club foot, much to the scandal of those of higher social status than he. When the novel opens, Jessamy is scheming to sneak away to compete in the Fives, an elaborate and dangerous race that takes place on an obstacle course. Her father is being fêted as the triumphant hero of a military success, even invited to bring his socially suspect concubine and daughters to witness his triumph as his sponsor and superior, General Ottonor rewards him for his military service. Jessamy manages to sneak away just long enough to run the Fives, but must deliberately lose the Fives competition or risk discovery. Her competitor, who is well aware that she let him win, is a highly placed Patron, Kalliarkos. Kaliarkos recognizes her after the competition, but promises to keep her secret. Jess’s life starts to go pear shaped when Ottonor unexpectedly dies. His extensive debts provide a remarkably convenient opportunity for Lord Gargaron to attach Jess’s father Esladas to his household, and wed him to Lord Gargaron’s niece. Gargaron takes great delight in revealing that Jessamy has been secretly, even scandalously competing in the Fives. He forces Jessamy to join his Fives “stable” to train, separating her from his sisters and mother, and dissolving her family and the home she has known her entire life. What’s more, it turns out that Kalliarkos is Gargaron’s nephew, and that Jessamy will be expected to train along side Kalliarkos. It turns out that nothing is exactly as Jessamy has thought, life is much more complicated, as is her own situation. Yet in the end, Kalliarkos, like Jessamy, proves both his loyalty and his courage, as both work to save Jessamy’s mother and siblings from a horrible fate. I think that’s a fair comparison, though Jessamy is both a compelling and a believable narrator. Court of Fives like Fran Wilde’s Updraft is a female bildungsroman, with a well-thought out and richly drawn world. Elliott’s subtle use of magic is especially well-done here, with a world that has both animated corpses and magically powered robotic spider warriors driven by soldiers. Elliott proves especially adept at navigating the troubled waters of a colonized culture, with complicated cross-cultural social, linguistic and class issues, and a much more complicated history than her protagonist Jess is initially aware of. I hope to read more about Jess and her world, and will definitely look for more of Elliott’s fiction. Elliott is both a Nebula and World Fantasy award finalist, and her latest book Black Wolves has just been released by Orbit. In addition to Kate Elliot’s website and blog, you can find her on Twitter as @KateElliottSFF. 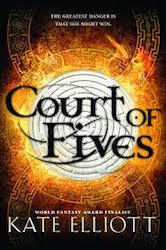 You can read an excerpt of Court of Fives at Tor.com.